In a few places (EVF, diopter, internal flash) the X-E1 actually is better specified than the X-Pro1. In a few other places (hybrid viewfinder, PC Sync), the X-Pro1 is better specified. The EVF on the X-E1 is 2.36m dot instead of the 1.44m dot one on the X-Pro1, for instance. Overall, the X-E1 presents itself as simple, clean, slightly retro style camera. Buttons are well marked and actually larger in size than most mirrorless cameras. The X-E1 does have its name writ large in white on the front, while the X-Pro1 is more low-profile and has no identity markings on the front. 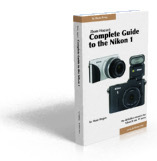 Read my X-Pro1 review. Pretty much everything I write there applies directly here with two exceptions. About the only performance piece that changes is battery performance. With the X-Pro1 I'm able to squeeze out some additional shots by avoiding using the EVF. With the X-E1, the EVF or LCD are always powered when you're shooting, so there's a constant draw on the battery you can't avoid. Curiously, Fujifilm doesn't put the CIPA specs in their brochures for the two cameras, probably because 350 shots doesn't look all that great for high-end cameras like these. An X-E1 user really needs to carry extra batteries handy if they want to do a full day of serious shooting. I'm averaging just over 300 shots a charge on my X-E1 in early testing, about the same as I was getting with the X-Pro1 using the EVF. It's not bad. 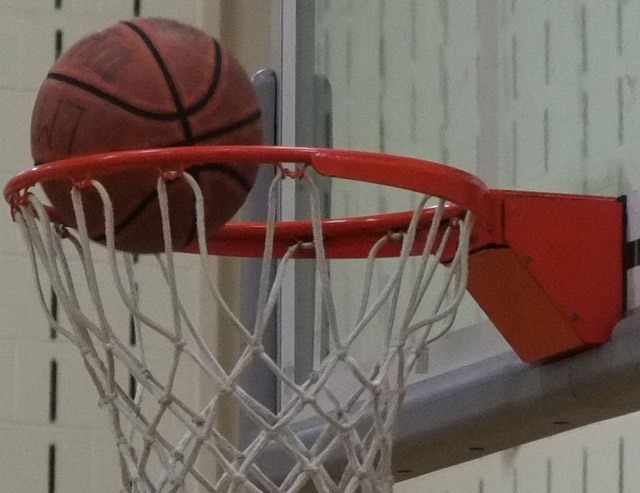 Noise is well tempered and detail in the net is still there. The colors have shifted a bit, though. What I usually call color "block up," which is usually caused by the reduced dynamic range at ISO 3200. 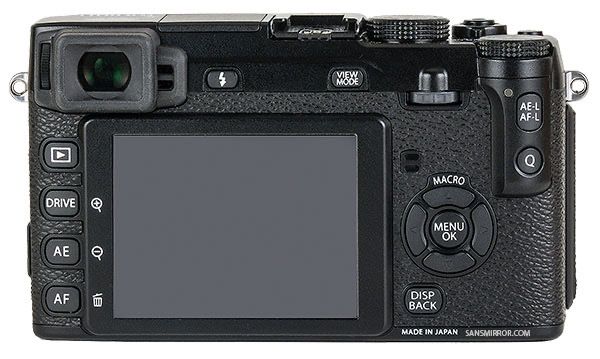 Aside: I'd guess that Fujifilm will update the X-Pro1 in 2013. 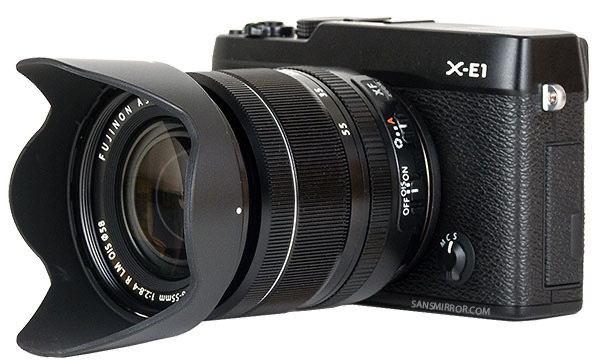 In so doing, I also suspect that they would try to add a few features to differentiate that model from the X-E1. There aren't a lot of obvious such features, but a positionable LCD might be one. Both are good cameras, and you need to make sure that none of the small list of differences tilts you one way or the other, but in terms of performance, they're essentially equal. The great JPEG quality Fujifilm is known for is present equally in both cameras. The handling is the same, though slightly miniaturized in a couple of places on the X-E1. The raw files are the same. The build quality is in the same league with both. In short, near identical twins, with only a couple of small feature differences differentiating them. So kudos to Fujifilm. They took a fine camera, did some careful liposuction and one feature cut, and didn't harm the patient at all. If anything, they created a slightly more compelling product due to the lower price point. Features — Other than sensor stabilization, nothing to complain about. Performance — the most controversial of my ratings, I'm sure. Thing is, for image quality it's probably a four star product despite the color smearing issue. But all the battery and focus performance factors would be a two compared to the competition (in other words, lower than average). A lot of you will see this differently than I. Image quality hounds would likely give this camera four stars. I, however, believe that performance is the sum of the parts, thus my rating. Value — Another area where I'm going to get disagreement. The lower price with basically only the removal of the hybrid viewfinder as a significant change pushes this camera slightly towards being a good value. That's especially true if you are a low light shooter, shoot with M-mount lenses, or can get by with the very good 18-55mm f/2.8-4 zoom.